SDK Bridge set out to find out what is most important to the people who use APIs by sending out a survey and asking them. We found, not surprisingly, that many thought that documentation could be better. When asked to rate quantitatively, people rated overviews, sample code, and API references the highest, followed closely by tutorials. When asked for open-ended comments, a large percentage mentioned working sample code as helpful, and an equally high percentage mentioned how important it is that documentation be complete and accurate. Two other important factors that were mentioned by several respondents are (1) it is very helpful to explain why you would use something in addition to how you use it and (2) good overviews can really help when getting started with a technology. Thirty six people respond to the survey. 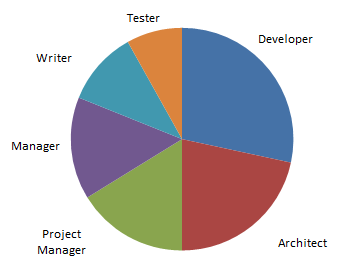 Half of them were either developers or architects, and other half were split between being project managers, managers, writers, and testers. When asked what kinds of APIs they were working with, the largest group said Web APIs, which is an indication of just how fast the Web API industry is growing. 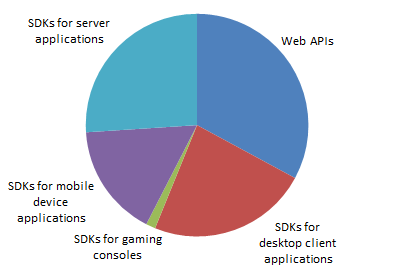 Server and desktop SDKs were next, followed by a significantly-sized group working with mobile SDKs, and a small number working with SDKs for gaming consoles. 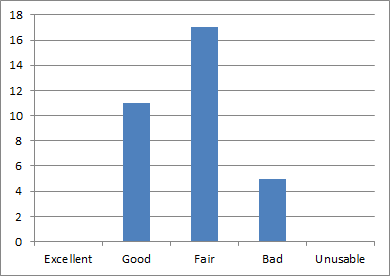 We asked people to rate the documentation that they are using. The answer came back pretty clearly as “fair”, with a few people responding “good” or “bad”. No one rated documentation as either “excellent” or “unusable”. Participants were asked to rate the usefulness of overviews and conceptual material, API reference material, sample code, tutorials, blogs, and forums. 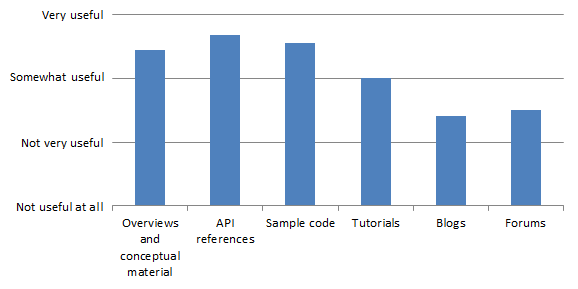 The following chart shows that overviews, API reference material, and sample code were all rated the most useful, followed by tutorials, and then followed by blogs and forums. What’s interesting about this data is how it breaks down into content that is written by professional programmer/writers as compared to content that is contributed by the developer community. Overviews and reference materials (almost always written by professional programmer/writers) are rated as between somewhat useful and very useful, as is sample code (sometimes written by professional programmer/writers and sometimes contributed by the developer community). Tutorials (also sometimes written by professional programmer/writers and sometimes contributed by the developer community) are rated lower as somewhat useful. 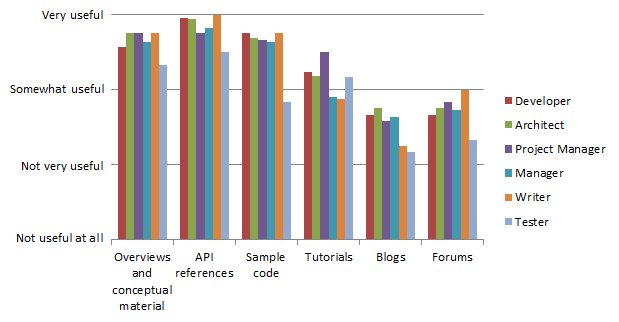 Forums and blogs (most often contributed by the developer community) are rated lowest, between somewhat useful and not very useful. So the general trend suggests that developers on average feel that content generated by professional writers is more useful than that contributed by the developer community. We broke down the data by roles to see if this had an effect on how these types were rated, but the effect was minor, as shown in the chart below. It appears that testers tend to find documentation less useful on the whole, with the exception of tutorials, which is not surprising. In addition, we broke down the data by types of APIs to see if this had an effect on how these documentation types were rated, but again, the effect was minor. What Makes Documentation Helpful or Not Helpful? Participants were asked what makes documentation helpful or not helpful. Some common themes emerged. The range of acceptable arguments. Clarity is important: explanations should be in plain language. Avoid minimal documentation: don’t explain a method or property by using the same words that make up the method or property name. Images are important for GUI-related APIs. Documentation should be organized so that it’s easy to find what you are looking for. Sample code should not do too many things unrelated to the API. “A good example [of API Documentation] is the Flickr API. On average, people consider the current state of the documentation they use to be “fair”. The most useful types of documentation are: overviews, references, and sample code. 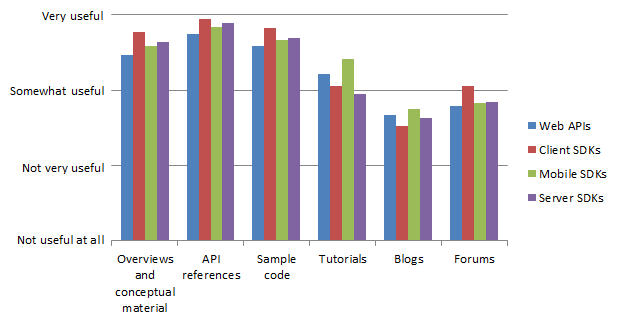 Tutorials are also considered somewhat useful, but blogs and forums are considered less useful. There is no strong trend in the data due to either the role someone plays or the type of API they are using. From the text-based part of the survey, we can conclude that sample code and completeness are clearly very important, followed by usage information so people understand why an API would be used and help getting started with good overview material. Sample code should actually be working code so that developers can start with it and build on it. Completeness means more than just descriptions of the various pieces of a method, property, or request; it means also describing the behavior, and especially the error conditions. Accuracy is also important, which is why the development team needs to set aside enough time for good technical reviews, something that can be difficult to accomplish. If your budget is limited, it appears that the best place to put effort into is to create good, working sample code and making sure that your documentation covers everything that it should and that it is as accurate as possible. You can increase the adoption of your platform by including real-world usage examples and by making it easy for developers to get started through good overview material.